Robert Burns is Scotland’s most famous poet and Tam O’Shanter, written in 1790 is one of his most famous poems. Souter Johnnie, lived in the the Ayrshire village of Kirkoswald and was one of the inspirations behind this poem. Owned by the National Trust for Scotland since 1932, Souter Johnnie’s Cottage is one of their flagship buildings. The village of Kirkolswald has many associations with Robert Burns. In the graveyard of the church, opposite the cottage many of his relatives are buried and his mother was born nearby. Many of Burns poems are based on the characters that he met and Souter Johnnie was one such person. His real name was John Davidson and he was a shoemaker or souter in the Scots language. 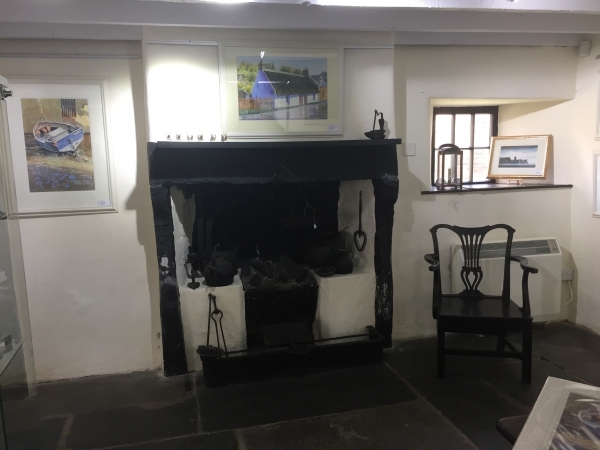 This cottage, built around 1785 was his home and has been fully restored to resemble how it would have looked in the 18th century. 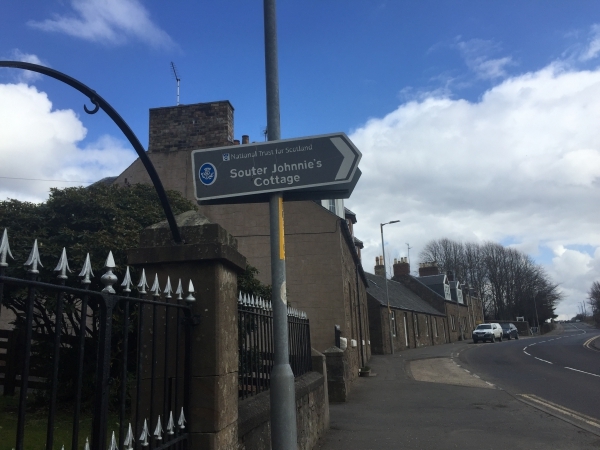 I’ve always known a bit about Souter Johnnie, my mother is from nearby Dumfriesshire and Robert Burns was a favourite subject matter of my grandmother, but the truth is I never really knew where Souter Johnnie’s Cottage was, so when I came upon a road sign recently I made a spur of the moment decision to visit. Kirkoswald is a very busy little village and heaving with Robert Burns thirsty tourists I struggled to find anywhere to park, but I did eventually find a spot very close to the cottage. The cottage occupies a position right on the main road that cuts through the village. First impression of the exterior confirms that this is a very old property. 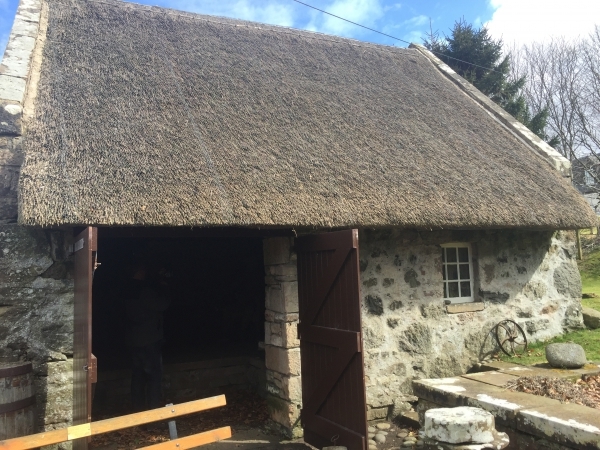 It is a long, single storey dwelling with a huge thatched roof. Access is through a tiny door right on the main road. Immediately inside the doorway we were greeted by a very friendly and enthusiastic member of staff behind a counter. The sign outside said “free entry” which the woman confirmed, but she then followed by a short sales pitch intended to get us to sign up for an annual membership with the National Trust, which we politely declined. Inside the first room where the reception desk is located there are several exhibits. 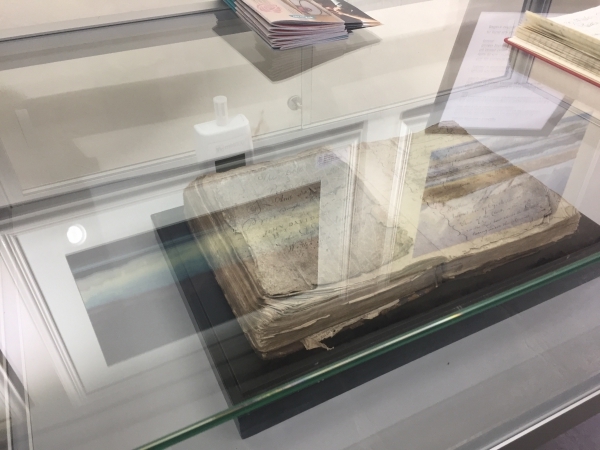 One of the most prized objects is Johnnie’s family bible, which is displayed inside a glass cabinet. 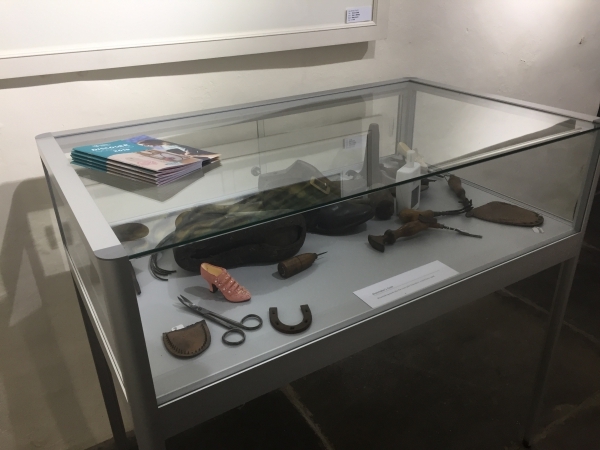 Another glass cabinet housed artefacts relating to the art of shoemaking and had items on display that Johnnie would have used everyday. On the walls there was a wealth of information about both the building and the man who lived here with his family. Initially I thought the room felt more like a museum than an authentic home, but there were some original features like a large open fireplace. The walls were adorned with a mixture of authentic items like a huge hunting gun and modern paintings by local artists, that were offered for sale. There are only two main rooms to the house. The second room being set out much more like a home with a table and chairs and lots of crockery but most of what you find here are reproductions. 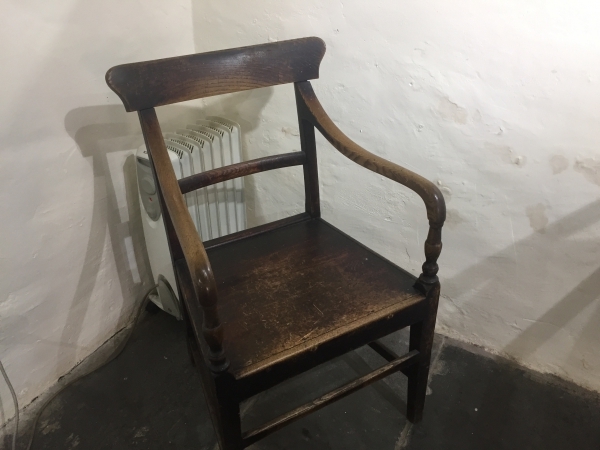 There is one piece of original furniture, which is a wooden chair. To the rear of the building there is a workshop which was full of tools that are again there to represent what might have been in Johnnie’s workshop. As we walked around the woman on reception kept appearing and pointed out several things that we would have otherwise missed. Amongst these was a tiny window known as a smuggler’s window. 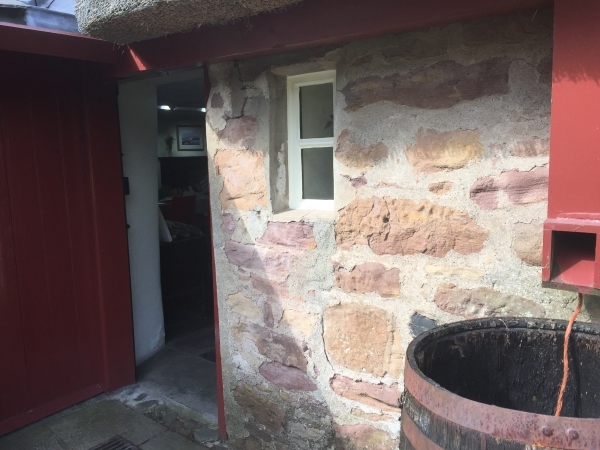 Apparently many of the cottages had such windows in the villages all along the Ayrshire coast where smuggling was rife in the 18th century. Robert Burns Tam O’Shanter tells the story of two men that drank too much and spent too much time in the alehouse, the poem tells the story of an evening when they saw two witches on their way home, dancing with the devil in the grounds of the old church across the road. The two men that are central to the poem are John Davidson (known as Souter Johnnie)and his neighbour, Douglas Graham (known as Tam). In the alehouse there are four lifesize figures made of sandstone. 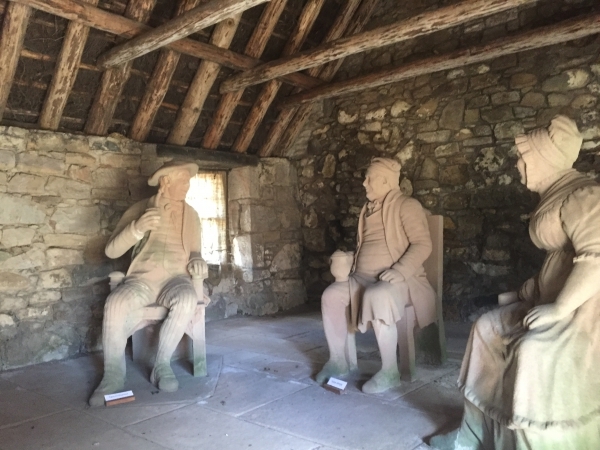 These four figures are Douglas Graham (Tam), John Davidson (Souter Johnnie)and the innkeeper and his wife. These figures date from 1830 and were made by a local artist. 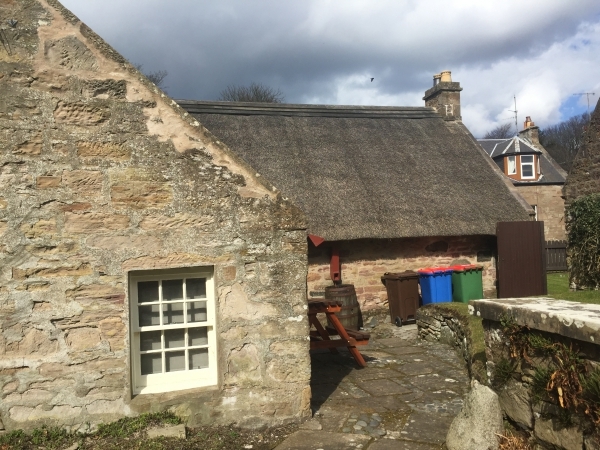 The National Trust for Scotland have actually used a bit of poetic license in creating this alehouse as this building was never an alehouse but it is there to represent what an alehouse would have looked like and to depict the four central characters of the poem. 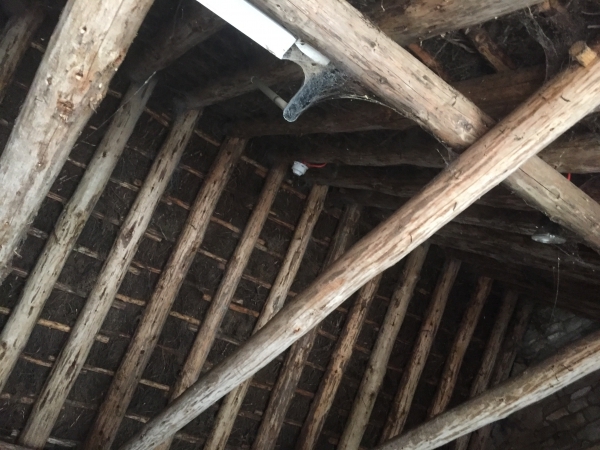 The original timber that supports the thatched roof of the alehouse building can be seen if you you look up. Souter Johnnie’s Cottage is well sign posted from many miles away. 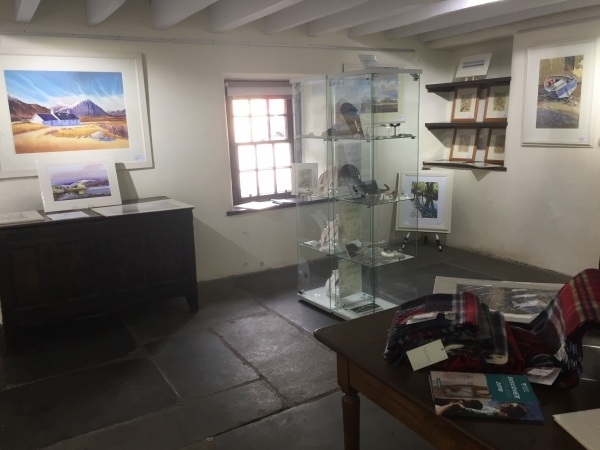 It is very unusual to find a National Trust property that is free to visit and I was surprised to find there was no admission charge here as it is such an important building in their portfolio. 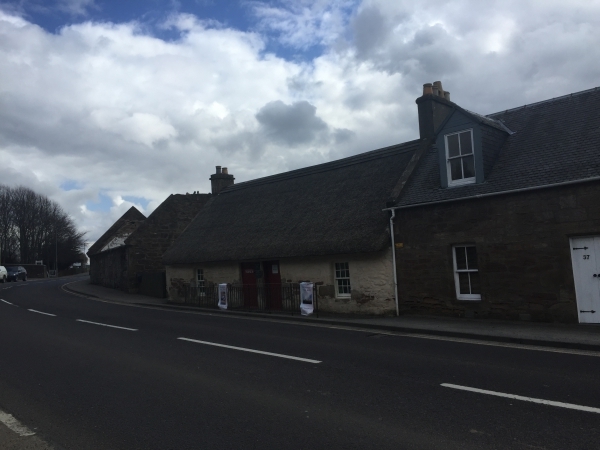 I visited in April 2018 and thoroughly enjoyed visiting Souter Johnnie’s Cottage and found it to be a fascinating insight into the life of a man that inspired Tam O’Shanter. The cottage opens daily from Easter to late September but is closed throughout the winter. Admission is free.